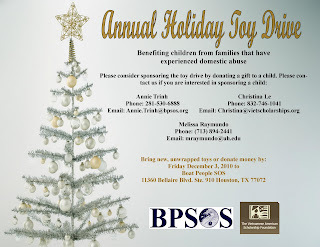 This is the third year that the Vietnamese American Scholarship Foundation will be co-hosting a Holiday Toy Drive with Boat People SOS. Thanks to some very generous sponsors and individuals, last year we were able to donate gifts to more than 200 children who come from families that have experienced domestic violence. We already have more than 100 children registered for this year's toy drive, and we need your help to make the event a success again this year. Please consider co-sponsoring the event or donating a toy to a child. The sponsorship and donation information is attached. On behalf of the children, we thank you!